Junction 29 Truckstop is a bespoke site geared up solely for truck drivers. Yes, you can turn up in your car, but it’s a bit off the beaten track, and it really is a place aimed for truckers’ benefit. As its name suggests it’s off Junction 29 of the M1 near Chesterfield. If heading northbound, come off the slip road and take the first exit – or third exit if coming south on the motorway. It is also easily accessible off the A617. Take the A6175 and simply follow the signs and you can’t miss it. 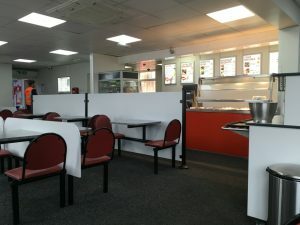 The facilities are very accessible, clean and the staff are very friendly as they serve you a good value meal. 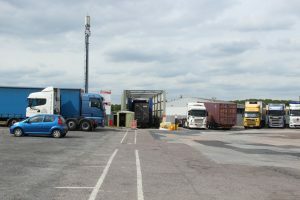 There are also plenty of facilities for truck drivers, head and shoulders above what many other establishments offer. A regular breakfast is just £4.40, a jumbo breakfast is £5.40 and a J29 XL breakfast is £6.10. There are also healthy and vegetarian breakfasts, or you can have cereal or breakfast rolls. All orders can be upped with two slices of toast for 80p or extras such as more bacon, sausages, beans, black pudding mushrooms, eggs, hash browns and the like. The café offers a wide selection of regular or large rolls, snacks on toast, and snack meals such as burger and chips, jacket potatoes, ham, egg and chips and the like. There are also omelettes and salads on offer. For those wanting a fuller lunch or evening meal, then there are established favourites like chili con carne, spaghetti bolognaise, curries, cottage pies, gammon, mixed grilles and fish and chips – amongst others. There is also a specials board, so the choice is varied and affordable – a main meal is typically £6.35. And after that, a wide selection of deserts – puddings cakes, crumbles and ice cream for example – all at £1.75 or less on their own right, but just £1.40 when ordered along with a main meal. You can easily have a main meal, desert and a drink for well under a tenner. There are vegetarian meals, children’s meals and take-out meals and sandwiches also on offer. The café opening hours at 0500-2100 (Mon-Thurs), 0500-2030 (Friday) and 0500-1200 on Saturdays. There is a covered, outdoor seating area and you can also eat your meal in the bar if you are stopping the night. There are ladies’ and gents’ showers and washrooms. 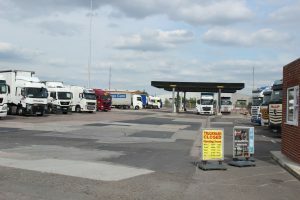 Security is a big plus for this truckstop, and as well as the site being fenced, floodlit and secure, it has CCTV, Number plate recognition and perimeter lighting. And on top of that it is also monitored by security patrols throughout the night by site staff. Between 2200-0600 the site operates a ‘no noise’ policy and trailer swaps/drops are not permitted and refrigerated units must be switched off. There is also a Hazardous loads parking area – drivers of such loads must report to a member of staff on arrival and park at least six bays away from the building and fuel tanks. Stays of less than two hours are free and overnight parking starts at £14.50, or you can pay £17.50 with a £6 voucher to spend in the café, bar or shop or £20 with a £7.50 voucher. The Junction 29 bar is a fully licensed freehouse selling beers at local prices. The large bar has a 52-inch TV showing Sky Sports and BT Sports, a pool table and dartboard, games machines and covered seating/smoking area. It offers a range of draft bitter, lager and cider, bottled beers, spirits and soft drinks and mixers as well as bar snacks of crisps, nuts and snacks. Junction 29’s diesel bunkering service includes eight high speed diesel pumps, includes one small nozzle small vehicles, four gas oil pumps and eight AdBlue pumps and is open 24/7 – 365 days. It offers a fully automated service – and all major fuel cards accepted. As well as a fuelling facility, there is a Truckwash which is open 0800-1730 on Mondays and Tuesdays and 0730-1730 on Wednesdays through to Fridays. 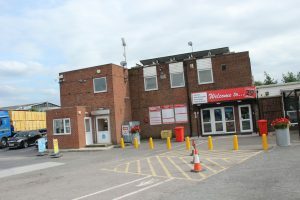 The shop sells newspapers, magazines, cigarettes, sweets and snacks, National Lottery and toiletries and there are also truck accessories and specialist products for drivers such as electrical equipment, TVs, cooking equipment, CB radios, vehicle hardware and accessories, cab care products and clothing. The shop is opened 0600-2030 apart from Fridays when it closes at 2000 and Saturdays at 1200. The site accepts sterling and Euros. The staff are very friendly and chatty, the delivery of food was quick and the quality was very good. The location and facilities on offer at Junction 29 make it an ideal place to stop off at and truck drivers should find all they need for a comfortable stopover and a break from driving, be it for a 45 minute break or an overnight stay. In short, Junction 29 is an excellent facility all round.